My name is Louella, and this is my first foray into Finder of the Fair territory! I was really excited to be asked and knew it would be hard to narrow down my choices. I have been a committed browser, purchaser and coveter of all things vintage for more years than I care to remember now, and nothing beats the 'hands on' excitement of an honest-to-goodness vintage fair experience. Here are some of the gorgeous offerings that caught my eye on February 14th! 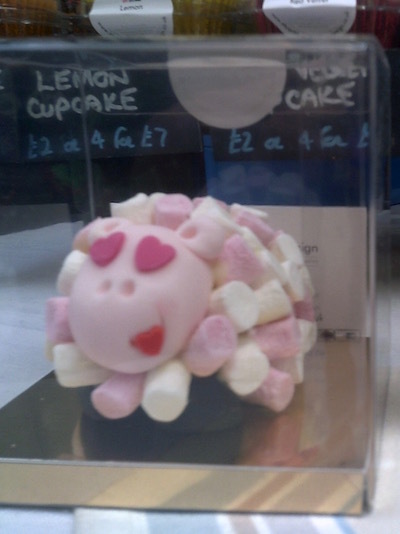 Stuart Thornley Cake Design is one of my favourite pit-stops, and what could be better than an 'I've only got eyes for ewe' cupid sheep treat? At the very special Valentine's price of £3.00, I do hope someone indulged themselves or a loved one with this too-good-to-eat delight! Mary Jones Vintage has one of the most prominent stalls at the Vintage Village and I always get side-tracked by her beautiful hats and bags. Being given strict instructions to only choose one thing from each vendor I selected for FotF, I had to have a hard think about which to pick. 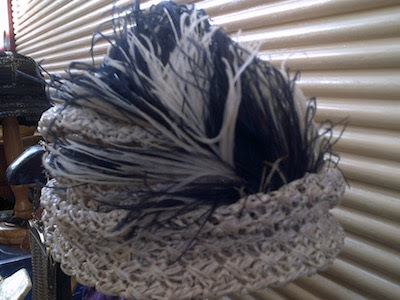 Eventually I plumped for this delicate and unusual original Selfridge’s straw hat from the 1930s. The dark blue feather is offset perfectly against the white background, and, although a considerable purchase price at £80.00, for something that has survived so long and still looks so fabulous, I don't see that as unreasonable at all! I must also admit to some subliminal influence from the current television series, and don't mind confessing to serious costume envy every time I watch! 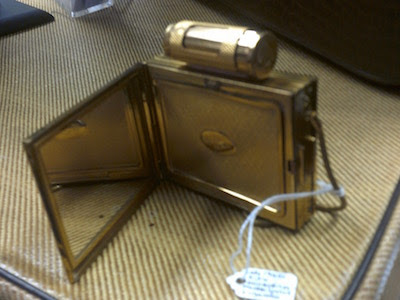 As well as the historic Market hall, the Vintage Village also incorporates 20th Century Stores, and TinTrunk is always a treasure trove of finds. On this occasion my magpie eye landed definitively on this stunning and covetable minaudière from the late 1940s. A tiny trio of evening essentials - powder compact, ciggies and lipstick - would dangle fetchingly from one's wrist on a night out. I can just imagine the stories this piece could tell of her owner's exploits! With a delightfully handwritten description and price tag, £55.00 for a Kiku brand essential of a bygone era would set any lady's heart fluttering to get this for Valentine's Day. 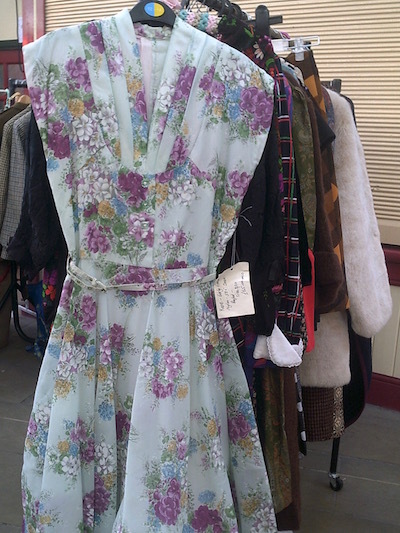 The lovely ladies at Re-Loved caught my attention with this simply pretty, floaty, floral 1950s Spring-Has-Sprung dress! Slightly optimistic given the, quite frankly, arctic temperatures of Stockport on the day, but a fabulous advance purchase for the right person. With a full underskirt and beautiful buttons, I defy anyone to claim that £55.00 would be too much for such a heart-lifting piece of original vintage. 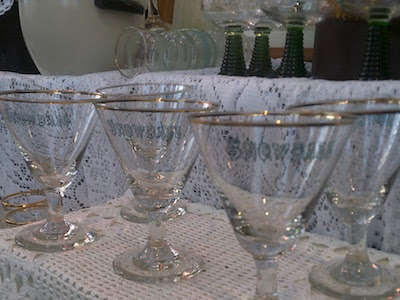 Fair regular Aileen at Retrodecs had these eye-catching and unusually shaped Snowball glasses taking pride of place on her stall, and no wonder; I have only ever seen the flute style before and I was hardly surprised to find they had been snapped up when I passed by a short while later. I'm so glad I took this shot when I did! They were an absolute steal at £25.00 for five. I wonder who their lucky new owner is? 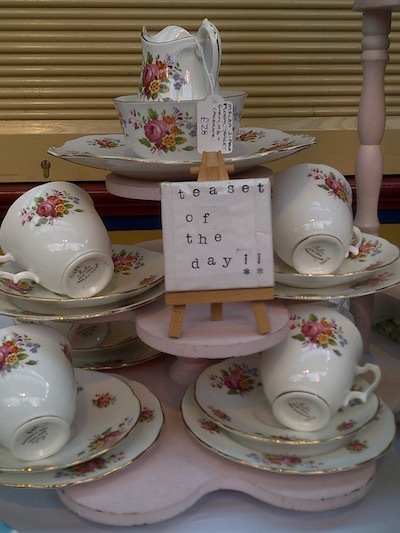 A Vintage Affair are one of the key vintage china purveyors at the Vintage Village, and their fantabulously floral 1950s display for 'tea set of the day' would be perfect for any sideboard or china cabinet. What a good price at just £28.00 for the whole lot; you would be able to serve tea for two (or three, or four) without breaking the piggy bank. [Editor here] What a perfectly romantic selection of treasures for a vintage Valentine's Day fair! Louella, it's been a pleasure to see your Finds, which reflect your glamorous style so well. Thank you!